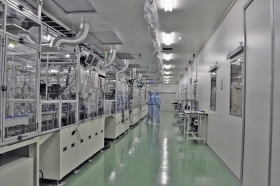 Hitachi's plant near Tokyo can build battery packs for 3,500 cars per month. TOKYO -- Hitachi Vehicle Energy Ltd., chosen to supply General Motors Co. with lithium ion battery packs for hybrid vehicles, is shipping samples of a new battery that is 50 percent more powerful than the ones it will sell to GM. The Japanese company, a closely held affiliate of a consumer and industrial electronics giant and a relative newcomer to the vehicle battery field, targets battery sales totaling ¥50 billion ($593.8 million) by 2015, up from what the company's president called "modest" sales today. Hitachi Vehicle Energy will start manufacturing its third-generation lithium ion batteries for GM by the end of the year, President Masafumi Yuhara said. But fourth-generation batteries currently under development will deliver about 1.5 times the energy output of the third-generation ones. The new rectangular batteries have an energy density of 4,500 watts per kilogram, compared with 3,000 watts in the current cylindrical third-generation batteries. The Japanese company has a factory north of Tokyo that can make 4.2 million lithium ion battery cells a year, or battery packs for about 3,500 cars per month. 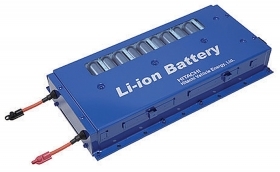 But from April through June, the production rate was only about 500 battery packs a month, Yuhara said in a written response to questions submitted by Automotive News. Until now, Hitachi's batteries have gone mostly into hybrid trucks made by Isuzu Motors Ltd. and Mitsubishi Fuso Truck and Bus Corp. But the company will ramp up production this year when it starts filling a GM contract, signed in 2008, for 100,000 battery packs for hybrid vehicles. GM has said it will use the batteries in mild hybrid versions of such vehicles as the Buick LaCrosse sedan. Hitachi makes batteries only for hybrid vehicles. But it is testing lithium ion power packs for plug-in hybrids and is also developing batteries for electric cars. Many Japanese carmakers have tried to bring battery making in-house by forming joint ventures with electronics companies. Nissan Motor Co., Toyota Motor Corp., Honda Motor Co. and Mitsubishi Motors Corp. have followed this model, teaming with such companies as NEC Corp., Panasonic Corp. and GS Yuasa Corp. But Yuhara says Hitachi intends to play the field. "We have no plans to form joint ventures with carmakers," he said. "Rather than forming a partnership with a specific carmaker, Hitachi Vehicle Energy aims to deliver to every carmaker." Hitachi Vehicle Energy was founded in 2004 by parent company Hitachi Ltd., which owns 65 percent, and two smaller partners, Shin-Kobe Electric Machinery Co. and Hitachi Maxell Ltd.
Hitachi Vehicle Energy said it thinks the biggest markets for batteries initially will be Japan, the United States and Europe. But Yuhara said China will become an increasingly important market.